In most organizations, the workstation configuration needs to conform to a specific standard. If you are using HP workstations, you will need a strategy on how to deploy the HP BIOS settings. The tool we will be using in this scenario is the HP BIOS Configuration Utility (BCU) . Enterprise OEMs such as DELL, HP and Lenovo provide solutions for deploying BIOS settings. The DELL and Lenovo solutions use executables or scripts which can be executed with different parameters, depending on what you want to Enable, Disable or Configure in the BIOS. 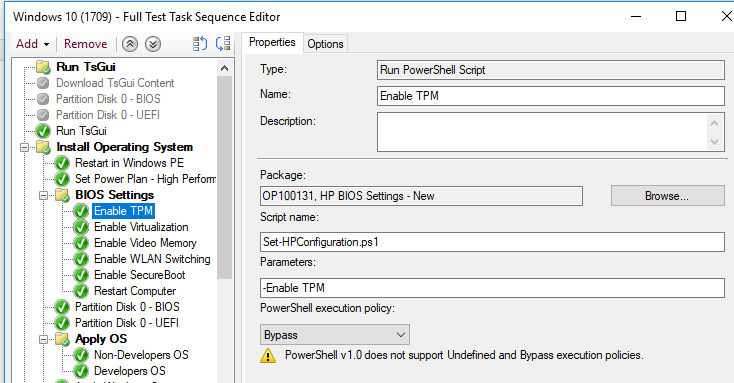 The HP solution – the HP BIOS Configuration Utility (BCU) works a bit differently. The HP BIOS Configuration Utility (BCU) uses an Export/Import function, where the idea is that for each model, you should export the BIOS settings, make the changes required and then re-import the required settings. I do not really like the standard method in the HP BIOS Configuration Utility (BCU), as it requires you to go in to each model and export the BIOS settings and then tweak them. I would rather have a solution similar to that of DELL and Lenovo, where I can use a script with different parameters for each feature, instead of triggering it per model. This is why I created the solution described in this blog post. You can of course configure other BIOS settings. How to accomplish this is later described in this blog post. BCU BIOS Configuration Utlity HP's command line utility for systematic deployment of BIOS settings. As I mentioned in the Introduction, HP BIOS settings have traditionally been configured using one exported configuration file which is modified and then re-imported. The common understanding was that a setting file with ALL BIOS settings had to be exported for each model. I also have seen strange behavior when reusing settings files between different models. In reality, settings that are not available on a specific model or specific BIOS version will automatically be skipped. Sometimes, settings can be named differently between different models. The solution is just to add all the different variants in to the settings file. The script works just as well with any other settings that you might wish to apply. Later in this blog post describe how to customize the script to add configuration of other settings. Since the HP BIOS Configuration Utility does not handle blank BIOS passwords well, I have previously created a Powershell script. There are some assumptions and prerequisites that need to be in place in order for this solution to work. 4.0.25.1 or later. This is because commands have changed between the different versions. Starting with 4.0.21.1, the commands for configuring new passwords and input of the existing passwords has changed from /nspwdfile and /cspwdfile to /npwdfile and /cpwdfile. A *.bin file containing the encrypted password in your organization. The script uses HP BIOS Configuration Utility together with an encrypted password file. The script will check if there is a password configured. If not, it will execute the HP BIOS Configuration Utility without a password. Otherwize it will use the passsword provided. NOTE: In BCU versions prior to 3.0.3.1 it was possible to specify the password as clear text in the command line, which is not possible in later versions. Instead of using one settings file with all the settings, we will be using one settings file per setting or group of settings. Executable for creating the encrypted password file. One setting file per setting or group of setting. This will need to be created. The script file that runs the logic for the HP BIOS settings configuration. The encrypted password file is created using HPQPswd64.exe, which is included in the HP BIOS Configuration Utility package. Enter the destination to the password file. Place the password file in the same folder as the solution. Open a command prompt as Administrator. Browse to the installation directory of the HP BIOS Configuration Utility, which is usually located at C:\Program Files (x86)\HP\BIOS Configuration Utility. The settings available will differ for each model. But you don’t need to worry as the setting will not be applied if the setting does not exist on the hardware. Create a new file with <Enable/Configure setting>. Remember to always include this at the top of the text file. Put the source files somewhere and start to create package. Review the settings and press Next and Finish. Add the steps to SCCM Task Sequence. Add one step for each setting. SELECT * FROM Win32_ComputerSystem WHERE Manufacturer like "%HP%"
SELECT * FROM Win32_ComputerSystem WHERE Manufacturer like "%Hewlett-Packard%"
This is what your end result should look like. You can also use these steps as a Task Sequence which you can deploy to running clients, and not just during operating system deployment. Using this method provides additional flexibility compared to the standard solution in the HP BIOS Configuration Utility (BCU). As always, there are countless number of methods to accomplish the same thing, but I have found that the solution provided in this blog post is easy to follow. As always, please leave comments below if you have any feedback or improvements to the solution. Downgrade HP TPM firmware from 2.0 to 1.2. Is this the reason the settings were not applied? How are you executing the Powershell script in the Task Sequence? You need to specify the settings that are to be Enabled and also make sure that you have a configuration file for each setting. I executed it exactly as in your post. I used your WLANSwitching, virtualization and Video Memory files as a test. They are all in one folder along with the BiosConfigUtility64.exe and the password.bin file. The PS script is left as is. When I run the TS, the CMD windows pops up with a “successfully read password from file” message, so I assumed it works and all I’m missing was a “set” command somewhere. Sorry for the late reply. It seems correct according to your screenshot. Can you send your version of the script as well as the configuration files used? I left everything as default, and implemented this exactly 3 weeks ago when I first sent the message. So latest version and default configurations. Do you have some infos about that? It sounds like the same issue as daniel explained above. Can you share the script and settings files that you are using? Thanks for this, once working this will be a great way to configure BIOS Settings! Can you confirm that the /npwdfile and /cpwdfile switches are correct? The below is from the HP Documentation? Thanks for your comment. Which version of HP BCU are you using? It seems like the current password file command has changed between the versions.